When you need a heart specialist, you want the best treatments delivered by skilled cardiologists who are experienced in personalizing the right care for you. That’s why, as part of the Mount Sinai Health System in New York, Mount Sinai Doctors Palm Beach has assembled a team of first-rate heart doctors equipped with all the newest diagnostics and therapies. In addition to superb medicine, we offer our patients convenient scheduling and personalized attention to ensure you’re receiving the best possible care. Our team of board certified heart doctors offers a range of diagnostic options and evidence-based treatments for many cardiovascular conditions, from basic care such as cholesterol and hypertension management to more complex disorders, including coronary artery disease, peripheral vascular disease, valvular heart disease, heart rhythm disorders, and congestive heart failure. Communication is key to our treatment approach. During your office visit, our staff listens to you and answers all your questions. If testing is required, we promptly schedule an appointment with you to thoroughly discuss results and next steps. We also keep in close touch with your primary or referring physician, and if you spend part of the year in the Northeast, we maintain close contact with your Mount Sinai doctors in New York to ensure continuity of care. The right treatment starts with the right diagnosis. We offer the best available testing, including echocardiograms, electrocardiograms and monitoring devices such as loop recorders on site. Patients can be referred to an affiliate office for stress testing and vascular ultrasound. Cardiac catheterization is performed by our doctors at local hospitals. Our heart doctors understand that each patient is different and are highly skilled in customizing the right treatment plan for your needs. As a new, state-of-the-art practice, we provide evaluation for the full range of advanced cardiac services. We determine whether patients may be candidates for hospital procedures such as angioplasty, stenting or transcatheter aortic valve replacement (TAVR). We also offer personalized device therapy, which includes not only the placement of pacemakers and defibrillators, but also careful, ongoing maintenance and optimization. In addition, we are committed to the importance of prevention by treating risk factors for heart disease and helping you follow a heart healthy diet and lifestyle. 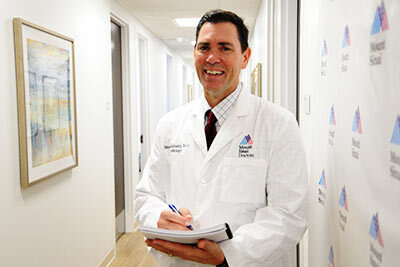 You may also see our physicians at our sister site, Mount Sinai Heart New York Palm Beach, which combines a patient-based approach with the most advanced treatment options in order to deliver comprehensive cardiovascular care. Services include preventive cardiology, echocardiography, nuclear cardiology, interventional cardiology, and electrophysiology. By choosing our cardiology practice, you’re getting the benefit of Mount Sinai’s unparalleled medical expertise right here in the convenience of our downtown West Palm Beach location. We know the importance of seeing a doctor when you need one, so we are available to you for same-day and walk-in appointments, and our friendly staff makes your time with us as pleasant as possible. Through this combination of superb medicine, convenience, and personalized attention, we are committed to preventing and effectively treating cardiovascular disease so you can get back to enjoying the life you love. Heart disease is the leading cause of death for both men and women in the United States, according to the U.S. Centers for Disease Control and Prevention, but there are lots of lifestyle changes you can make to lower your risk. From getting up off the couch to skipping the fast food, these tips will help keep your cardiovascular system healthy. Get your heart pumping with at least 30 minutes of physical activity and aerobic exercise every day. Find something you like to do so you’re more likely to stick with it, whether it’s brisk walking, swimming, bicycling, or spending time at the gym. Your heart doctor can help determine the best regimen for you. A heart-healthy diet includes plenty of colorful fruits and vegetables, as well as whole grains, legumes, nuts, non-tropical vegetable oils, and fish and poultry without skin. It’s also important to cut back on sugar-sweetened beverages, sweets, red meat, excessive fat, and salt. Being overweight or obese is linked to a number of heart disease risk factors, such as hypertension (high blood pressure), high triglyceride and blood cholesterol levels, and diabetes. So follow a daily diet and exercise regimen that keeps your weight in check. Because cigarette smoke narrows and damages arteries, it is vitally important not to smoke. It’s also crucial to lessen your exposure to secondhand smoke, which has been linked to coronary artery calcification, a build-up of calcium in the arteries that indicates heart disease. When it comes to heart attack and stroke, quick treatment is crucial. While symptoms can vary, signs of heart attack can include discomfort near the middle of the chest that goes on for more than a few minutes, and possible discomfort in the neck, back, stomach, jaw, or one or both arms. Other symptoms are nausea, lightheadedness, and shortness of breath. Signs of stroke include face drooping, arm weakness, and speech difficulty. If these symptoms appear, call 911 immediately.